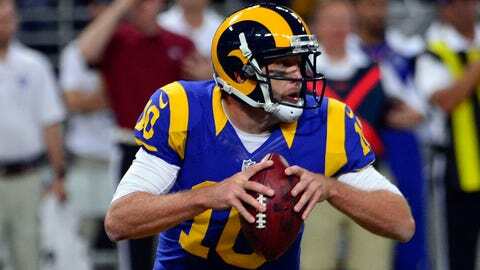 Kellen Clemens and the Rams can still finish with a .500 record this season, a mark they haven't reached since 2006. ST. LOUIS — The St. Louis Rams won’t make the playoffs this season, but they are aiming to finish the year with a .500 record for the first time since 2006 and get some momentum going into the 2014 campaign. An unexpected 27-16 win against the visiting Saints last week has given the Rams a boost of energy and excitement late in the season. They will host a similar team in Tampa Bay (4-10) on Sunday, a squad that lost its first eight games, but is 4-2 over its past six contests and is also looking to gain some steam going into 2014. "They’re ready," Rams coach Jeff Fisher said of his team. "Yeah, they’re excited. They understand that this is not the Tampa Bay team that went 0-8. This is a good football team. As we’ve mentioned to them, I think in the last six weeks, they’ve either gotten points on the opening drive or the second drive. And it’s a very good defense." The Rams are 4-3 at home this season â with wins against Arizona, Jacksonville, Chicago and New Orleans and losses to San Francisco, Seattle and Tennessee. St. Louis did not have a turnover in the wins against Jacksonville, Chicago and New Orleans. It has two each in the other four games, in which the Rams went 1-3. Fisher’s squad is averaging 141.4 yards rushing per game at home, compared to 88.6 on the road. St. Louis is averaging 181 yards rushing in its last five home games. Tampa Bay is 1-5 on the road this season, with a win against Detroit and losses against the New York Jets, New England, Atlanta, Seattle and Carolina. The Rams’ standout defensive end was dominant in the win against the Saints last week, wrecking havoc on New Orleans with five tackles, two sacks, two forced fumbles and one fumble recovery and adding to his resume as a defensive player of the year candidate. Quinn, in his third year out of North Carolina, has done plenty of damage to opposing offenses this season. He leads the NFC with 15 sacks and leads the Rams with 33 quarterback pressures and 31 quarterback hits. On Sunday, the player trying to slow down Quinn will be Bucs left tackle Donald Penn, a 6-foot-5, 340-pounder in his eighth NFL season. "Robert’s playing at an elite level, there’s no doubt about it," Tampa coach Greg Schiano said. "You look at his 15 sacks, seven forced fumbles â that’s pretty incredible stuff, seven forced fumbles, think about that. So, you better know where he is. Donald Penn will be matching up with him. We’ll help him out some, but you can’t help a guy all the time. Donald’s a veteran offensive tackle. I know he’s looking forward to the challenge, so we’re going to have to do a bunch of things. You’re not going to stop him the way he’s playing right now, but certainly we’d like to make sure he doesn’t take over the game." Tampa Bay allowed four sacks against the 49ers last week, including two by Aldon Smith and one from Justin Smith. The Bucs allowed just one sack the previous game against Buffalo but allowed five the week before that against Carolina. Whether or not Penn and the Buccaneers offensive line can contain Quinn will be big factor on Sunday. You could make a case that the Rams quarterback had the best game of his career last week against the Saints. Clemens completed a career-best 70 percent of his passes for 158 yards with two touchdowns and no interceptions and had a 126.7 passer rating. The two touchdown passes tied his career high â he threw two against the Colts â and his single-game passer rating was second only to the 140.6 he recorded at Indianapolis. "I think we got him off to a good start," Rams offensive coordinator Brian Schottenheimer said following practice on Thursday. "I think he had a good week of practice. He’s a guy that’s going to work. … He had a good week of practice. He’s a confident guy and it helps a little bit when you get a… you don’t normally get a 31-yard touchdown on a little fire pass to the flat. Again, I thought he played really, really well." Clemens has done a good job of filling in since Sam Bradford got hurt. He’s now 3-4 as a starter, having completed 54.8 percent of his passes for 1,339 yards, seven touchdowns, five interceptions and a passer rating of 78.7. No one should be calling for Clemens to be the starter next week when Bradford is healthy, but he has managed games well when the Rams have been able to run the ball and when he has limited his mistakes. He’s 3-1 as a starter when not throwing an interception and 0-3 when he has. He threw two interceptions apiece against the Seahawks and the Cardinals and threw one against the 49ers. This Sunday’s game will mark just the 20th career start for Clemens, the second-round pick by the Jets out of Oregon in 2006. He is 7-12 as a starter with a 53.4 completion percentage, 14 touchdowns, 14 interceptions and a 71.3 passer rating. "He certainly is leading the group," Schottenheimer said. "There’s a tempo that he’s got us playing at right now, which is good."